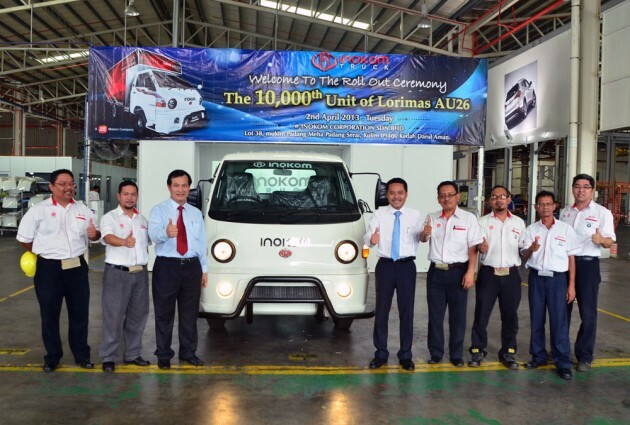 Inokom held a ceremony last week to mark the rollout of the 10,000th unit of the Lorimas AU26 from the company’s plant in Kulim. The Inokom-badged 1.5-tonne truck is the first Hyundai light-duty truck to be assembled locally, and Inokom has being doing it since year 2000. “The Lorimas AU26 which is Korea’s number one best seller is selling very well here with an average sales of 1,200 units a year since 2010. It’s a practical light-duty truck and it is also value for money with a 2.6L Euro 1 engine that offers good speed, acceleration and fuel economy,” said Ng Lian Bee, head of commercial vehicle, operations, Hyundai-Sime Darby Motors. Besides the Lorimas AU26, Inokom also assembles the AD3 five tonner. With these two Hyundai trucks, Inokom is averaging more than 1,600 units per year with a market share of 11% in the light-duty CV segment. Their target is 20%, to be achieved by increasing the production of existing models and also the introduction of new trucks, said Ng. Inokom, a subsidiary of Sime Darby Motors, is targeting production of 20,000 vehicles this year, from 14,000 in 2012. The 20k total will include some 6,000 BMW cars, 8,000 units of the Hyundai Elantra, i10, Santa Fe and AD3 truck, plus 6,000 Mazdas, Land Rover Defenders and commercial vans. inokom staff must be very skilled…can assemble all sort of vehicles…from basic passenger car to luxury sedan…from small 1.5 tonne truck to 5 tonne behemoth…salute! Still do not understand why Hyundai cars assembled by Inokom is called Inokom and not Hyundai, does it make the car cheaper? And why is it when they assemble Mazda and BMW, these cars are not called Inokom 3 or CX 5 or Inokom 320, 520? Uniquely Malaysia???? FYI, Inokom is the contract assembler for the car brand such as Mazda, BMW, Hyundai, and many more (total 8 brands). thumbs up for the record..thumbs down for the face..
thumbs up for what..?? stupid rebadged.. 10,000?? Somebody actually bought this??! Congrats! But I am surprised to read that the truck is still using an engine that is compliant with Euro 1! Guess it is not environmentally friendly. No wonder the government is still holding back the diesel quality at Euro 2 instead of moving it to Euro 4 and beyond. Funny thing is that the local refinery can produce Euro 4 or 5 easily. anything to thumb up? inokom is just d bn colony who rob ur hard earn money. they dun hav own tech nor design, just rebadging but charging higher pricing.